One of the delightful things about The Bold Type thus far has been its aversion to drama for drama’s sake. These young women make decisions and act on them with poise (for the most part), argue and readily apologize, and generally comport themselves in a reasonable manner. It’s low-key, but far from dull. There’s a world of difference between subdued and lazy, and The Bold Type has often been the former and rarely the latter. “Before Tequila Sunrise” isn’t lazy, either, but it’s a lot closer than some previous episodes have been. The title seems to reference Richard Linklater’s Before Sunrise, a lovely, laid-back film that basically consists of two people (Ethan Hawke and Julie Delpy) wandering around Vienna after meeting on a train. They walk, they talk, and that’s the movie. It works because both the characters and the screenplay are incredibly rich, and because the audience lives through this one night alongside those characters. It’s a fine source of inspiration, but there are two big problems here. The first is that we’re not following one pair, but three. The second is that not all of those pairs are all that interesting — and that’s where the aforementioned laziness pops in. “Before Tequila Sunrise” splits up its primary “throuple” (thanks, opening voiceover!) Adena calls Kat to tell her she’s being held at customs and will be forced to leave the country in the morning, and so Kat buys a $11,000 plane ticket so that she can get into the airport to be with her. Jane and Sutton both get stuck in the office when a Trump visit to New York gets the building shut down by Secret Service. While they spend some time together, it’s mostly a chance for both women to pair off: Jane with newly unemployed Pinstripe Guy, who we will now refer to as Ryan, as calling him Formerly-of-Pinstripe Guy just seems rude; Sutton with Alex, he of the “I’d kiss you right now” declarations and the largely absent personality. Each of these stories work individually, at least a little. 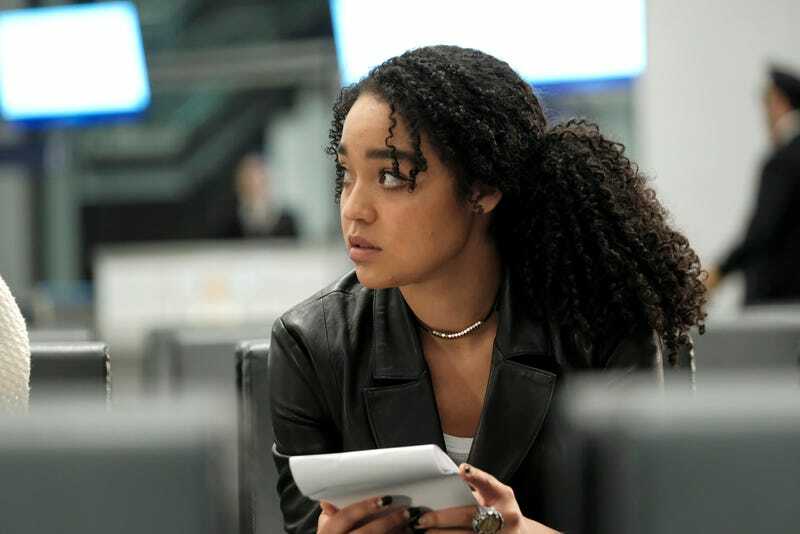 The most successful of the three is Kat and Adena’s story, which finds an anchor in two terrific performances from Aisha Dee and Nikohl Boosheri. Together, Boosheri and Dee come closest to achieving that Before Sunrise balance of meaningful and mundane conversation. As The Bold Type has spent more time with that pair than any of the others (including Sutton and Richard, I’d guess, but I don’t have my stopwatch handy), theirs is also the most engaging romantic connection, and the layer of sorrow and fear that floats beneath the surface makes it all the richer and more lovely. Dee in particular is wonderful, dipping a toe here and there in regret, shame, self-discovery, elation, and finally fear and shame again. The biggest issue with this story is simply that there wasn’t enough of it, and while we’re probably not quite far enough along in The Bold Type’s run for the show to make such an attempt, this airport evening alone would make for a hell of an episode. Kat risks her heart with Adena, but she can’t bring herself to take that larger risk, even as it calls her name. Alas, we left Adena and Kat behind for Jane, Sutton, and their paramours getting drunk in Jacqueline’s office. Jane’s storyline picks up about where you’d expect, with her writing a pro-con list (or pro-pro, in her words) about where she’d like to work in the back of a cab, sandwiched between her two friends. From there, she’s driven by anxiety about the choice she has to make, but also about concealing that choice from her boss and co-workers. She does a very bad job at that last one. While there’s some playful stuff with the whole trapped quartet (briefly a quintet, when Jacqueline offers them scotch), it’s mostly Jane and Ryan, talking about risks and playing it safe. While their pas de deux isn’t as compelling as Adena and Kat’s, there’s a level of cleverness to the writing here that bodes well for the future of the series. In “Three Girls In A Tub,” Jane realized she wanted a relationship, recognized she wasn’t likely to get that from then-Pinstripe Guy, and ended things. At the time, that seemed like a woman recognizing that who we want and what we need don’t always line up, and that denying your own needs leads to confusion and pain for both parties. While all that remains true, the show here underlines (via Sutton) that Jane didn’t really wait to see what might happen if she let things evolve more slowly. Tying that decision to the one before her in “Before Tequila Sunrise” is unexpected, and undeniably effective. Jane walked away before, avoiding risk, and while we don’t know what will happen with Ryan in the future, it’s clear she’s embracing her fear of the unknown. And then there’s the Sutton and Alex story, by far the weakest of the three. There’s a simple reason: Alex is almost a non-entity on the show. With the exception of a single episode of Arrow, I’m largely unfamiliar with Matt Ward’s filmography, so I can’t speak to how compelling he is elsewhere. Here, he’s given very little to do beyond occasionally flirting with Sutton and exchanging frank looks with Jane, and the result is a character about whom we know little, whose chemistry with his primary scene-partner is insignificant at best, and whose biggest moment outside his connection with Sutton is here largely brushed aside. A week ago, Alex seemed ready to leave Scarlet, and now he’s happy where he is; a job he seemed to want went to a coworker, and he’s wholly unbothered. If there’s a character-driven reason behind these beats, they’re damn hard to spot. Ward’s lack of chemistry with Meghann Fahy may make their seemingly inevitable hookup fall flat, but the larger issue is that the lack of definition in Alex’s character strips any emotional resonance from this storyline. Because he’s there simply as a friend and romantic interest, not as a person with his own wants and needs, the riskiness of Sutton’s choices here lose most of their potency. This story seems to be headed either for lingering romantic connection — unlikely, as Sutton seems to still be in love with Richard — or to a very difficult place. Going home with a co-worker is one thing, hooking up with a good friend another, and while neither has to necessarily lead to disaster, both are things you might wish to avoid when you’re in a kind of lousy place emotionally. Both Sutton and Alex have put themselves at risk — in their jobs and their friendship — but because there’s so little to care about when it comes to Alex, those risks lose much of their meaning. For contrast, compare this to Jane and Ryan’s arc. First, because it centers on Jane’s personal and professional choices and how they reflect each other, the fact that Ryan’s not a particularly nuanced character doesn’t matter much. He’s there are a foil for Jane (and it helps that Katie Stevens and Dan Jeannotte have loads more chemistry than the other pair). But second, Ryan is much better defined than Alex, because the show introduced him by playing against the audience’s expectations. He seemed to be one thing, and was revealed to be more complex and dynamic than expected. Alex, however, appeared to be a person who works at Scarlet who also likes Sutton, and he’s still a person who works at Scarlet who also likes Sutton. It’s lazy storytelling, and it pokes a great big hole in an episode that otherwise lands somewhere between good and lovely. As nearly every television season nears its end, a series will roll out an episode designed to set the table for the finale to come. “Before Tequila Sunrise” is such an episode, and it’s a mostly successful one. Because the three women who lead the show are so well-drawn, it’s easy to invest in their choices, and to care about how they go about making those choices, even when the consequences are yet to come. 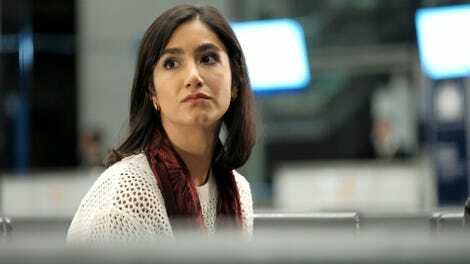 If The Bold Type can invest as much in its supporting characters as it does in the women on whom it centers, it might not hit Before Sunrise heights, but it’ll be pretty damn impressive. I have not lived the kind of life where the first class lounge has been an option, so if you have lived that kind of life, tell me: is there really a little semi-private section in which one might bang? Dear world, please stop using eyelash curlers while in motion, you’re making me very nervous. Silver boots: yes. Moment when someone calls Jane ‘Tiny Jane”: no. On Jane’s pro-pro list, Scarlet edition: company town car, awesome coffee, fashion closet, and “I work for Jacqueline Carlyle,” among others. On Jane’s pro-pro list for Incite (which is totally a stand-in for Vice, yes? With that font? ): no more puff pieces, well-funded, and “pushes the envelope”, as well both a work-from-home mention and an “I don’t have to work in an office.” Those last two shouldn’t count as separate things, which means the list is no longer tied. Whoops.